The CMP has recently received a large quantity of Remington-made .22LR ammunition, now ready for immediate sale in 5000-rd cases. This 1990s-vintage ammunition has a 40gr lead round-nose bullet and a Muzzle Velocity of approximately 1135 fps. This stuff is a bargain. Price is $125.00 per 5000-rd case plus $24.95 shipping/handling. (That works out to $1.25 per 50-rd box). Item number is 4S22RSURP-5000. Ammo is now available on the CMP E-store but will not be available in the CMP Stores for another two weeks. CLICK HERE to ORDER. This is U.S. Military-contract Remington .22LR ammunition. Each 5000-rd case comes in original packaging, consisting of ten (10) 500-rd bricks made up of ten (10) 50-rd boxes each. The 5000-round case is over-wrapped in a sealed foil barrier for long-term storage. For more information visit www.thecmp.org/Sales/ammo.htm. NOTE: Purchasers must provide proof of citizenship and be a member of a CMP-affiliated club. See CMP Eligibility Rules. 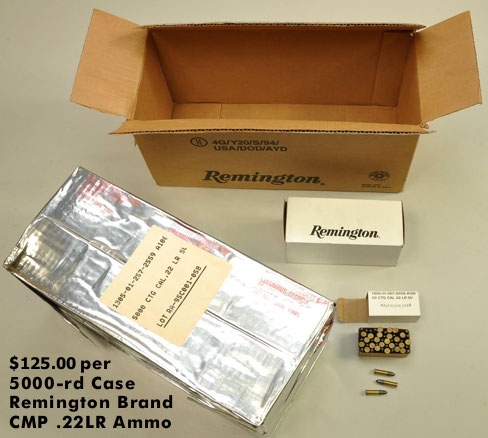 Share the post "Remington Rimfire Ammo for $1.25 per 50-rd Box from CMP"
Unless Remington has improved their quality control in the past few years, I would not use this ammo in pistols as it is unreliable, i.e. you will get several duds in a box of 50. In my match bullseye competition days, 1960 thru 2005, I tried many times to use Rem. std. velocity. Was always plagued by a massive number of mis-fires. Pulled the bullets dumped the powder & always found the priming mix to be horseshoe shaped, with an area that had no priming. Naturally, that’s where the firing pin hit. Switched to another brand of std. velocity & never had problems. It might be worth a try but I haven’t had much luck with Remington .22 ammo pretty much ever. Sure it is great for the occasional semi auto ripping but not much else. If anything odds are this being a bit older that it is probably better than their current offerings. I’d split a case with someone to try at least for the money.